From cross-stitch to CrossFit, from personal development to web development, from mindfulness training to Minecraft modding, thousands of content creators are making money online by creating and selling online courses. But how do you create buzz about your course and get people to sign up? How can you reach more people with news about your courses? How do you even know if enough people will be interested? By pre-launching your online course. Pre-launching your online course is one of the best ways you can create buzz, validate the commercial potential of your idea, and expand your audience. In this comprehensive guide, we'll be covering everything you need to know about pre-launching your course. We'll be looking at what you'll need before you can pre-launch, what great online course pre-launches look like, why growing your email list is so important, and how to create stunning landing pages as part of your pre-launch plan. 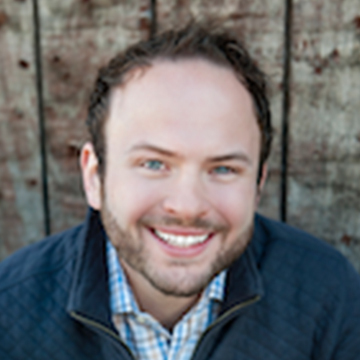 First, let's talk about what pre-launching an online course actually is. What does 'pre-launching an online course' mean? Pre-launching an online course is the process of creating buzz about an online course before the course is formally launched and made available for purchase. One way to think of an online course pre-launch is as a kind of “teaser” of what prospective students can expect from your course. This might include a broad overview of the topics you'll cover, a sneak preview of the video content you'll be featuring, and other tantalizing details to encourage people to sign up for your course. Something that many people don't realize is that you don't need the entirety of your course content to be complete before you can pre-launch your online course. In fact, it's arguably better not to create all your course content before you pre-launch. By only creating some of your course content for your pre-launch, you can effectively gauge interest in your course - and projected revenues you'll earn from your course - without having to create an entire course's worth of material. This approach will also save you a ton of time and effort producing a course with limited commercial appeal, and prime you to make your first sale a much easier one. A crucial element of any online course pre-launch is a strong email list. Email is an amazingly effective marketing channel. It might not be as hip as social media marketing, but email is a solid, dependable workhorse that can help you sell your course to more people. We'll be taking a look at building an email list for your online course pre-launch a little later. 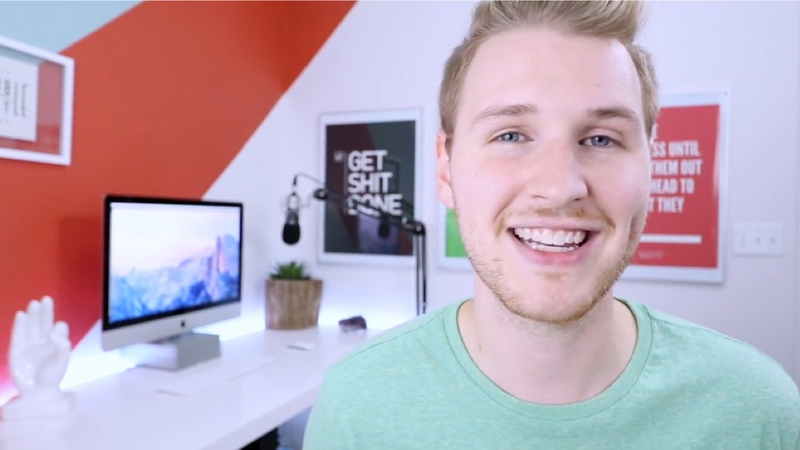 With that out of the way, let's look at how to actually pre-launch your online course! How do I pre-launch my online course? Regardless of what your course is about or what you plan to teach, there are two primary stages to pre-launching an online course: building your email list and creating the “teaser” content that you'll show off in your pre-launch materials. Building an email list for your online course is the first step in any pre-launch plan.You can think of building your email list as a way of identifying and reaching out to your core audience. These are the people who are interested in what you have to teach and who will ultimately be buying your course. The main idea behind building an email list is to create a “warm” audience of prospective students who will be receptive to what you're offering. Podia offers content creators two opportunities to include email sign-up forms on their pre-launch pages - once at the top of the pre-launch page and again beneath the main course description. This gives prospective students two opportunities to sign up for your newsletter, which can have a significant impact on conversion rates over time. The next phase of your pre-launch plan should be to create some content for your pre-launch. As we mentioned earlier, there's no need to create the entirety of your course's material before pre-launching your course. There's nothing stopping you from putting the entire course together beforehand, of course, but it's far from mandatory. It tells prospective students what the course is about and what they can expect to learn. It shows prospective students what kind of projects they'll be working on. It outlines the specific skills or techniques prospective students will learn and how they can be applied. Although text is crucially important to your online course pre-launch plan, your teaser content should be primarily visual. This could include video (including animation or motion graphics), still imagery such as screenshots or high-resolution photographs, and even code snippets or interactive apps. Visual assets not only convey a great deal of information very quickly but also allow the prospective student to see exactly what they'll be learning. So, how much content should you aim to produce before pre-launching your course? Although no two courses are exactly alike, you should aim to have around one-fifth of your course's content produced and ready to go by the time you pre-launch. This should be just enough information to let your prospective students know what to expect and feel confident signing up to take your course. Another consideration to bear in mind when assembling your pre-launch content is providing a sufficiently broad overview of the entire course. Producing around 20% of your course's total content should be enough for a pre-launch, but that 20% should cover the whole course, not just the first few lessons. What tools do I need to pre-launch my online course? Now that we know what an online course pre-launch is and the stages involved, it's time to talk about the tools you'll need to pre-launch your course. For the purposes of this guide, we're going to focus on the tools you'll need to actually pre-launch your course, not the tools you'll need to actually record and edit video for your course. Fortunately, there are very few tools necessary to pre-launch an online course. Assuming you already have roughly 20% of your course's content ready to go, the only tools you need are an email marketing tool and a landing page tool. Let's take a look at each. Email marketing is fundamental to an online course pre-launch plan, which makes choosing the right email marketing tool very important. Fortunately, you can build and manage your email list directly within Podia. Our email marketing tools make it effortless to create and send beautiful HTML emails to your prospective students. Creating engaging emails in Podia couldn't be easier. 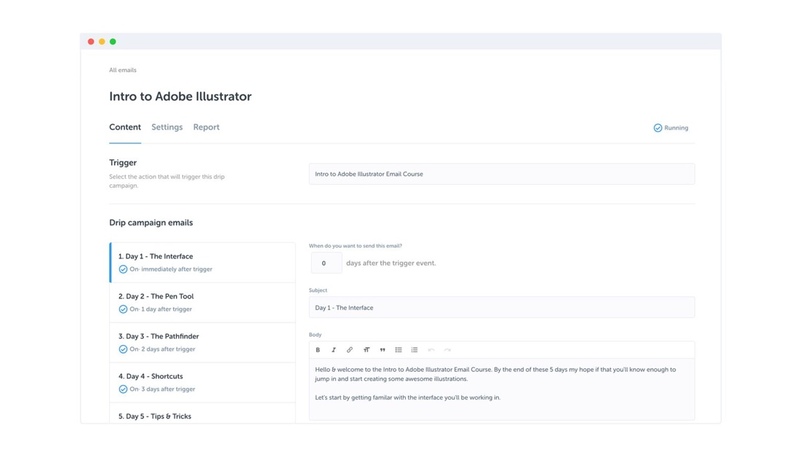 Podia allows you to create stunning emails in a matter of minutes using intuitive, user-friendly templates and offers a range of advanced functionality such as custom action triggers for drip and nurture campaigns, timing options, and audience targeting and segmentation settings to control who gets which emails and when. Email marketing can be an incredibly powerful tool, but you don't need to be an expert marketer to get the most out of Podia's email marketing tools. Everything about Podia's email marketing tools has been built with online productcreators in mind. That means no wading through dozens of menus and hundreds of options to find the tools you need, no frustrating bottlenecks to navigate, and no previous marketing experience required. Diving into the data behind your email campaigns in Podia is even easier than creating your emails in the first place. Simply navigate to the Analytics overview of your email campaign to see a range of data about your campaigns, including the number of clicks, opens, and unsubscribes, and other important metrics. Of course, you don't have to use Podia to manage your email marketing campaigns, and there are plenty of email service providers out there that offer a wide range of tools, features, and functionality. Although there's certainly no shortage of email tools on the market, generally speaking, there are few meaningful differences between the various email marketing solutions available today. Some of the more popular email marketing products out there include AWeber, Constant Contact, Customer.io, Drip, and MailChimp. Although specific features vary from one provider and plan to another, most include everything you need to create engaging, high-converting email blasts, including a range of templates, audience segmentation options, and analytics data, among other functionality. Something to be aware of when choosing an email marketing tool that many content creators overlook is who technically owns your list. Some email marketing providers and online course marketplaces allow you to create email blasts to send to prospective students but don't actually give you access to or ownership of the list. This means you're completely reliant on whoever owns your email list, and you could lose all your subscribers' information if the company goes bust or they change their terms of service. Alongside email marketing, the other pillar of our pre-launch plan is the humble landing page. Landing pages can be very effective lead-capture tools, but they're also one of the “leakiest” stages of the conversion funnel. That's why getting your landing page right is so important. Similar to the email marketing tools we mentioned above, there are plenty of excellent landing page tools available, including popular tools such as Instapage, Leadpages, and Unbounce. And, just as with email marketing, Podia also offers an easy-to-use pre-launch page builder. Creators using Podia to sell their online courses can use their digital storefronts to attract new students and encourage them to sign up for their newsletter, sell courses and downloadsdirectly to students, and add teaser pages as part of a pre-launch plan. What does a good online course pre-launch look like? So far, we've talked about what goes into an online course pre-launch, and the tools we'll need to launch our own. Now it's time to take a look at some more examples of successful online course pre-launches for a little inspiration! Note that while the examples below may not necessarily still be in the pre-launch stage, there's plenty to learn from these successful Podia content creators. 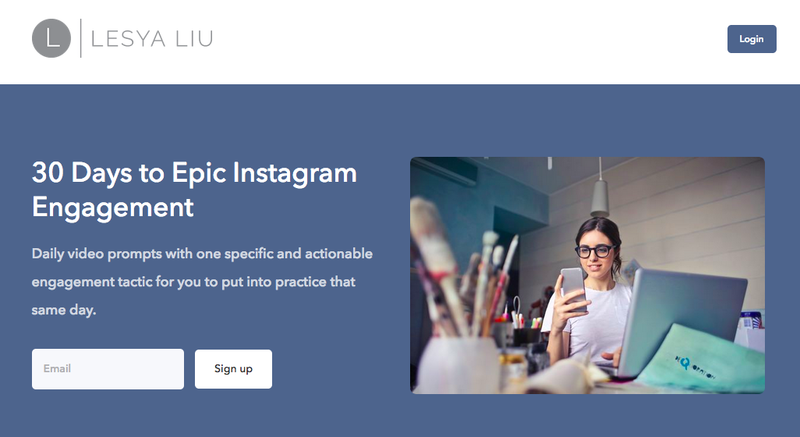 Take a look at the pre-launch landing page for the online course below, 30 Days to Epic Instagram Engagement, taught by content creator and social media expert Lesya Liu. In this course, Lesya teaches students how to dramatically ramp up engagement with their Instagram profiles in just 30 days. Lesya's pre-launch landing page is a fantastic example of how to entice people to sign up for an online course. First, check out the introductory copy. It tells prospective students exactly what to expect from Lesya's course - daily video prompts, each with a specific, actionable engagement tactic - and asks only for prospects' email address. Lesya's copy gets everything right. For one, Lesya uses first-person voice to establish a connection with the reader and poses questions that appeal to the reader's emotions - a powerful behavioral trigger. This question / answer, problem / solution approach is highly effective, because it taps directly into the very problem that Lesya's prospective students are trying to solve i.e. boosting engagement with their Instagram profiles, before offering a direct solution to that problem. It also quickly shows prospective students that Lesya understands the frustration that many people experience when trying to increase their social audience, which further strengthens the bond with the reader. Another potential problem that Lesya's landing page copy effectively preempts is the time investment typically necessary to improve social performance. As a social media expert, Lesya knows that many people can be intimidated by the time and effort required to drive engagement on social, which is why she cleverly emphasizes the ease and simplicity of her course. 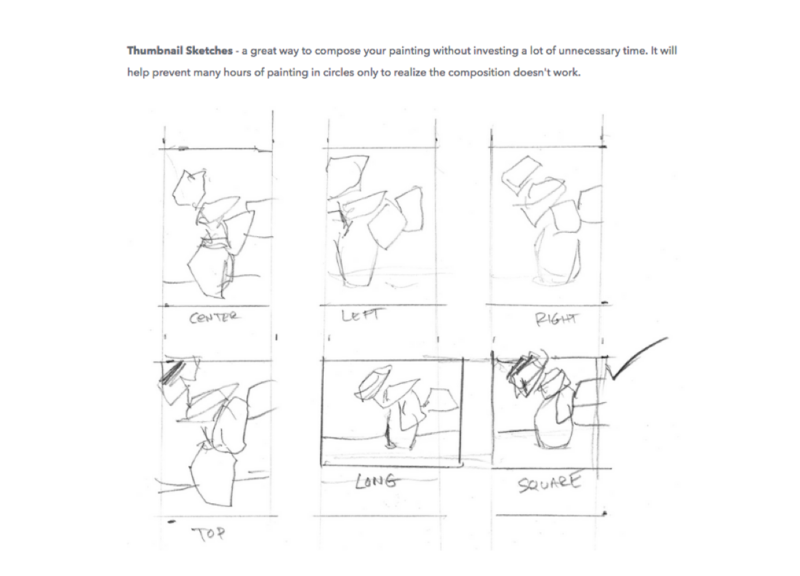 Robert Joyner - AKA Painthog - offers a range of art courses through Podia, and Robert's Still Life with Flowers Using Acrylics class has some excellent takeaways for creators building their first online course pre-launch. As you can see in the screenshots below, Robert uses primarily visual assets to explain exactly what students will learn in this course - a great example of how effective visual assets can be in an online course pre-launch plan. 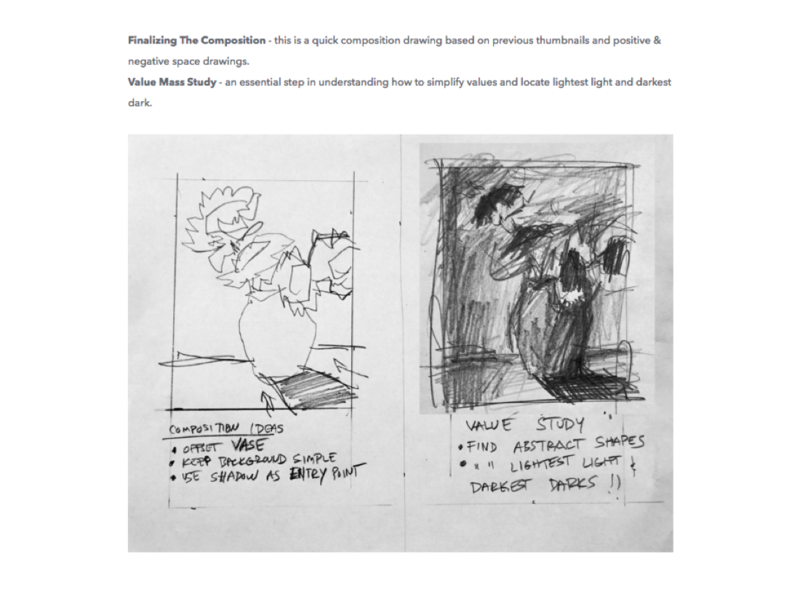 Robert uses real examples of sketches, drawings, and paintings to reinforce each of the artistic concepts covered. What's really clever about Robert's approach is that each step outlined on this course page builds on the concepts covered in the previous lesson. This gives prospective students an excellent idea of not only what they'll be learning, but how each lesson fits into the broader structure of the course - and not a boring, stuffy curriculum in sight! Robert's course is no longer in pre-launch mode, but his course page is an excellent example of what content creators gearing up to launch their own online courses should consider including in their pre-launch planning. 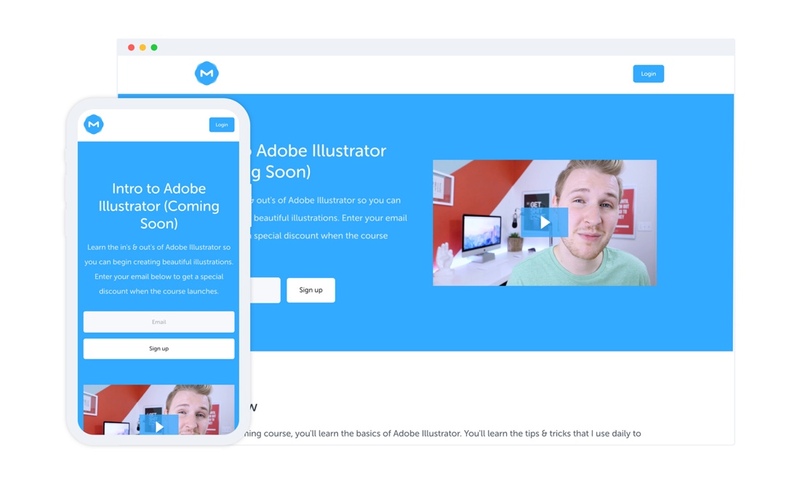 Another great example of how to create content for the pre-launch of your online course comes courtesy of Mackenzie Child, whose Design for Developers course has been extremely popular. Something that every content creator can learn from Mackenzie's course content is the value of video when it comes to breaking down complex topics quickly. For example, understanding the differences between user interface (UI) design and user experience (UX) design is crucial for aspiring designers but can be intimidating to newcomers or those unfamiliar with fundamental design concepts. That's what makes Mackenzie's explainer videos so great. Mackenzie makes excellent use of video content as part of his digital storefront, as video is unbeatable for simplifying complex topics or making the material more accessible. As such, Mackenzie's video on UI vs. UX design would be a great addition to his course's pre-launch plan. What do good online course pre-launch email templates look like? Building your email list is a crucial part of your online course pre-launch plan. Fortunately, there are plenty of solid email templates we can use as the basis for our own pre-launch emails. Founded in 2012, San Francisco-based design collective Hack Design has taught aspiring designers the fundamentals of the craft by sending email lessons to subscribers once a week. 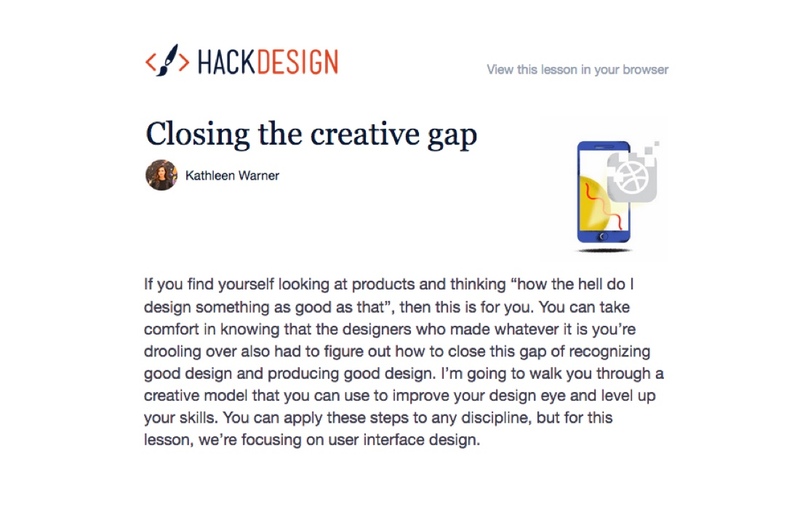 As well as offering newbie and aspiring designers a wealth of design knowledge in their inbox every week, Hack Design also has a lot that content creators preparing to launch their online courses can learn from. It's worth noting that Hack Design's course is delivered via email, not just promoted via email, meaning that we're more concerned with the content of the emails rather than how they're built and delivered. What makes these emails so valuable are that they're giving away the kind of knowledge and expertise that many companies would happily sell at a premium. Each Hack Design lesson could easily be a unit or module in a broader online course. This gives the reader something of genuine, actionable value every single week while simultaneously helping Hack Design develop a positive rapport with its audience and establishing Hack Design as a trustworthy, reliable learning resource. It's this kind of relationship-building that can help boost your pre-launch sales and establish yourself as a creative professional and differentiate your online course from similar offerings. The other element of this email that makes it so effective is the style and tone of the content. Hack Design's emails are friendly and accessible, but what's really great about these emails is that they make no assumptions about the experience or education of the reader. Sure, there are concepts covered that may be unfamiliar to some readers, and some topics are more advanced than others, but this email series remains warm, open, and welcoming - something that any content creator could apply to their own email campaigns. It may not appear that career advice site The Muse would have much in the way of actionable tips for content creators preparing to pre-launch their online course, but there's more to learn from The Muse's emails than meets the eye. Take a look at the email above. Although this email is clearly a sales email promoting The Muse's career guidance services, it's the style, tone, and language used in the email we're most interested in. Notice how the first paragraph of copy has a sympathetic tone? This is particularly clever, as The Muse understands how wretchedly miserable looking for a new job can be. The email's use of connecting language (words like “we,” “us,” and “our”) reiterates that understanding and establishes a rapport with the reader. The other element of this email that is remarkably effective is the use of questions as subheadings for the two paragraphs that follow the introductory paragraph. By asking the reader questions, The Muse is personalizing its appeal to its readers and acknowledging negative, potentially stressful feelings that the reader may be experiencing. This implicitly tells the reader that The Muse understands their pain and can help them take actionable steps to solving their problem. Even the copy in the second and third paragraphs would be ideal as a starting point for content creators getting ready to launch their online courses. 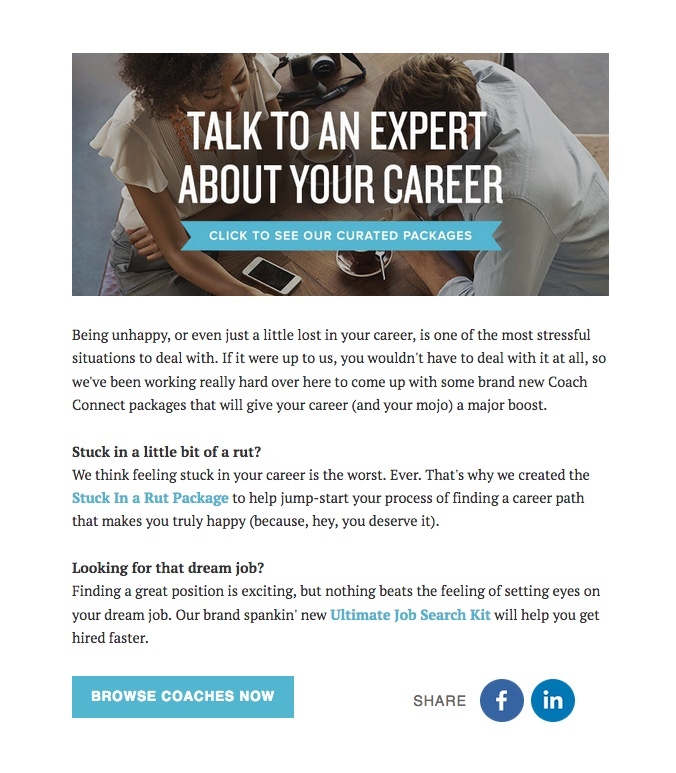 Not only is the copy primarily benefit-driven (i.e., the copy focuses on how the reader can benefit from what The Muse is offering), but it also lends itself extremely well to introducing the reader to specific products - in this case, The Muse's consulting service and its Ultimate Job Search Kit. It wouldn't take much to adapt this copy for your own purposes, regardless of what you're teaching in your course. Want even more tips on how to craft compelling emails that convert? Then check out this guide to writing killer sales emails. What do good online course pre-launch landing pages look like? Now that we've seen some email templates we can use to craft our own compelling pre-launch emails, let's take a look at some landing page templates you can use to create high-converting landing pages for your online course. 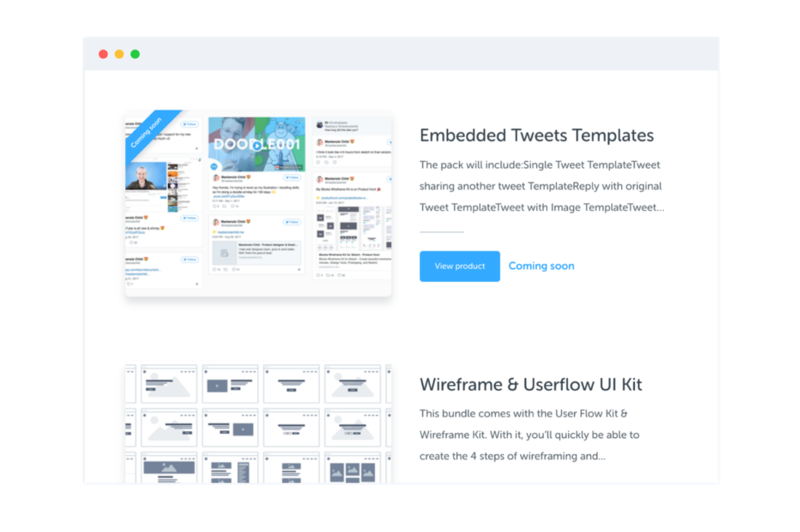 Again, we're more interested in the elements of these landing pages rather than individual templates that are available to download from specific resources. Ecommerce platform Shopify is a great way for small business owners to create a stylish ecommerce site. Although Shopify is really easy to use, getting started with ecommerce can be overwhelming to newcomers, which is why Shopify's landing pages have so much we can learn from. Take the landing page above, for example. This landing page offers an overview of what makes Shopify ideal for those new to ecommerce sales by using primarily benefit-driven copy. The first section tackles a very common problem among small businesses hoping to sell goods online, which is branding consistency and the (perceived) need for a professional designer. This landing page puts the reader's mind at ease by emphasizing that not only do Shopify's storefronts look beautiful, they also don't require any design skills or experience to create. By reassuring the reader that they don't need to hire a professional designer or possess design skills of their own, Shopify has preemptively addressed one of the most common problems faced by small businesses and emphasized how easy Shopify is to use as a platform. The second section is similarly clever. This section reiterates how easily everything in Shopify can be managed through the platform's centralized dashboard and emphasizes how easy managing a digital storefront really is. Finally, the use of a checklist-style list of benefits makes it effortless for even casual readers to scan and understand the benefits of using Shopify. 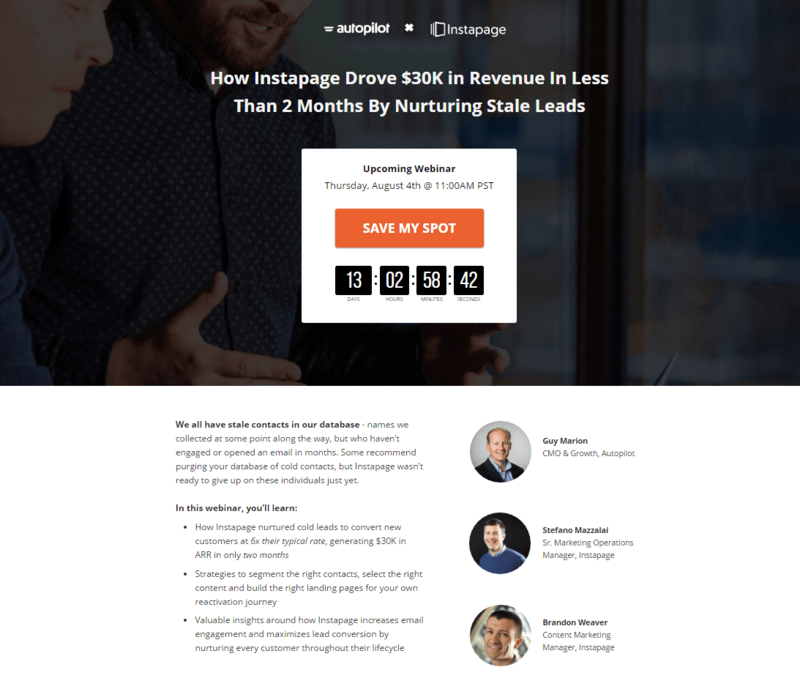 Our next landing page example is a true landing page for a webinar hosted by email marketing automation service Autopilot. 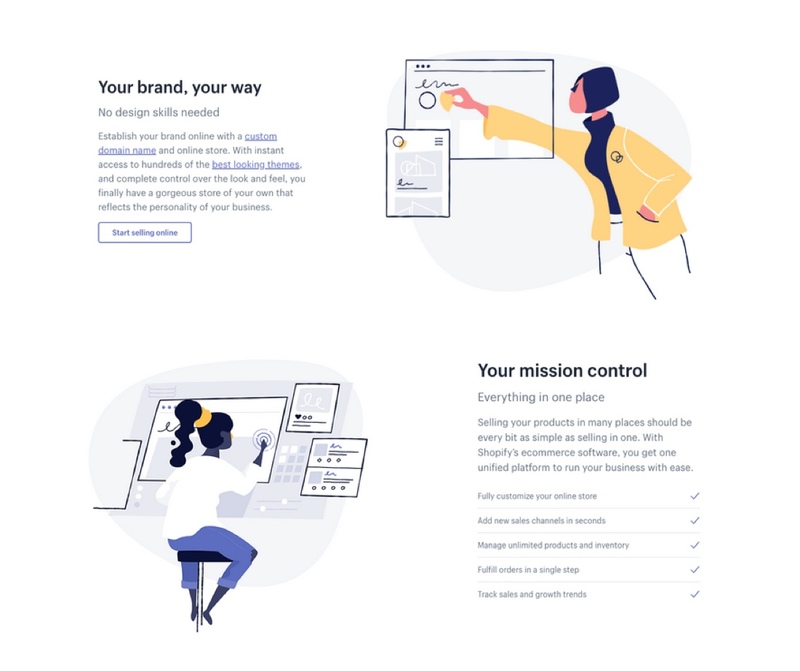 Although this might not appear particularly relevant to online course creators at first glance, this highly optimized landing page is a prime example of a page that gets almost everything right. The first thing this page nails right off the bat is the title of the webinar. They could have used more generalized language in the headline, but by providing as many specifics as possible - what the company achieved (generated $30,000 in revenue), how long it took them to do it (less than two months), and what they did (nurtured stale leads) - prospective attendees know exactly what to expect from this webinar. This not only appeals to the webinar's target audience of sales professionals hoping to increase revenue by revisiting cold leads but also significantly reduces the likelihood of attendees experiencing “buyer's remorse” by surprising or disappointing them with the webinar's topic or content. The countdown timer might not be relevant to you as a course creator, but the sense of urgency it creates can be a highly persuasive element that leverages the “fear of missing out,” a powerful psychological trigger that can be leveraged to great effect. The call-to-action button is written in strong, first-person language with an active verb, which can be similarly compelling. Imagine if the CTA were something bland and forgettable like “Reserve” or “Request details.” Would you be tempted to click on either of these CTAs? Exactly. This landing page also really nails the copy. There isn't too much text overwhelming the reader, and the benefits of attending the webinar are clearly listed in an easy-to-read bulleted list, making the page even easier to scan(whichis how we read most of the content we see every day). Pre-launching an online course is a crucial part of creating and selling educational content online. By taking the steps above, you're setting yourself up for success and laying the foundation for earning money by teaching people how to do the things you love to do. If you're ready to start earning an income by selling online courses, try Podia completely free to see how easy selling online courses can be.